You’ve probably had people tell you to “be positive” or “don’t worry.” While optimism is a valuable trait in many situations, you shouldn’t let it prevent you from knowing what to do in a crisis or buying the right emergency gear. Window breaker/Seatbelt cutter tool: If your RV is in an accident and ends up sinking in a body of water, this tool is a lifesaver (literally). It is capable of slicing cleanly through a locked seatbelt and easily breaking glass windows. The tool attaches to a keychain for easy access. First-aid kit: From minor cuts and scrapes to large-scale injuries, it always pays to be prepared. You should always keep a first-aid kit in your car and RV for unexpected emergencies. Fire extinguisher: This is an obvious one, but always make sure you keep a fire extinguisher in an easily accessible spot in your RV. In addition to purchasing a standard extinguisher, you can install an automatic extinguisher system in the engine compartment, behind the fridge, or throughout the rig. Emergency information card: In case you are involved in an accident and are unconscious when help arrives, be sure to keep an emergency information card in your wallet or pocket at all times. You can buy one to fill out, or make your own with a laminator. Make sure to include your blood type, allergies, and emergency contacts. Pepper spray: You should always have a way to defend yourself, especially while camping. Who knows when some creep is going to sneak out of the woods in the middle of the night? This pepper spray attaches to your keychain and sprays up to 10 feet. Bear spray: Bear spray can be a valuable asset when camping in the woods or mountains, especially in Alaska. With a range of 35 feet, it allows you to stop wild animal attacks before they happen. Bottled water: In the event that something happens to your holding tanks and you are stranded far from civilization, it’s important to have an extra water supply. Keep enough bottled water for your group stored away in your RV. Water purification tablets: If you’re low on storage, an alternative to packing bottled water is to pack water purification tablets. These can cleanse natural water sources of harmful bacteria and make them safe to drink in just 30 minutes. Flash drive: It t may not seem like an emergency item, but a waterproof flash drive containing a will, vehicle titles, and other emergency documents is much more practical than carrying around loads of paperwork. Analog compass: If you end up stranded in a remote area, a good old-fashioned compass is a necessity. Yes, a compass app is available for most smartphones, but if your phone dies, you’ll want a backup navigation system. A paper map of the area is a good idea as well. Glow sticks: During a long-term emergency without electricity, glow sticks are a reliable and waterproof way to produce light. Use them to find your way through the RV, make necessary repairs, or get the attention of rescuers. Batteries: Make sure you pack extra batteries to power devices like flashlights, radios, and walkie-talkies. The last thing you want is for the batteries in all your emergency electronics to die. Portable smartphone charger: A portable smartphone charger can be useful if you wind up with a dead RV battery, especially when you can get a cell signal. 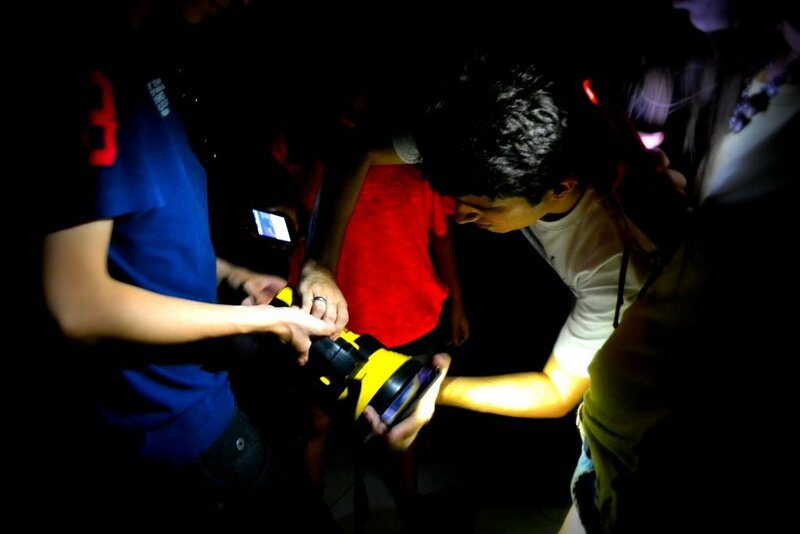 This one is waterproof, solar powered, and features a built-in compass and flashlight. Hand crank radio: When you don’t have cell service, you’ll need another way to get weather updates. This hand crank emergency radio warns you about threatening forecasts and requires no battery. It also features a USB port for charging your smartphone. Solar battery charger: Prevent your RV battery from dying by hooking up a weatherproof solar trickle charger. Even on cloudy days, this solar panel can convert sunlight into electricity and keep your battery fully charged. Jumper cables: Jumper cables are an essential part of any roadside emergency kit. 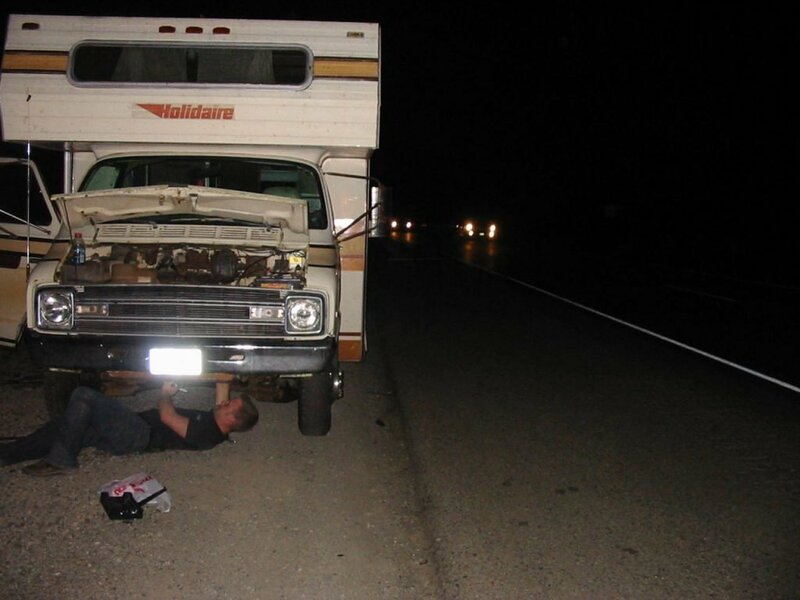 If your RV or tow vehicle battery dies, you’ll want to restart it. Just hope that another car comes along and is willing to help. Tow strap: There’s always the chance that your RV could get stuck, especially if you’re camping on the beach. This tow strap can pull up to 11,000 pounds and save your vehicle. Emergency flares: Although traditional roadside flares are a common choice, these electronic ones are brighter and last for up to 12 hours. They are also safer and more environmentally friendly, as they don’t release dangerous chemicals or create a fire hazard. Wheel chocks: Use wheel chocks when parking your trailer to prevent it from rolling away, either at the campsite or on the side of the road during an emergency. They might seem like an unnecessary precaution, but the second your trailer starts to leave without you, you’ll wish you had used the chocks. 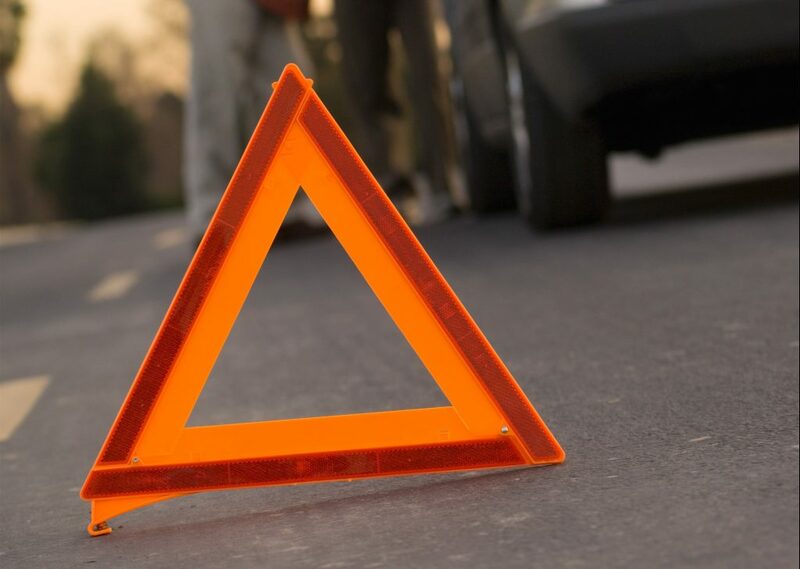 Warning triangles: Give other drivers time to slow down by placing emergency warning triangles along the road behind your broken-down vehicle. You can use these during the day or at night. Safety whistle: If your vehicle malfunctions and you end up stranded without cell service, a safety whistle can save your life. Use it to signal to anyone within a mile. Motor oil: Don’t get stuck without motor oil. Bring some with you so that you can change it if you need to, and bring a funnel to make it easier on yourself. Extra fuel: When camping, it’s easy to run low on fuel far from a gas station. Keep a supply of extra gas or diesel with you, and avoid becoming stranded in the wilderness. Cash: Not many people carry cash with them these days, but you should definitely keep some in your tow car or RV. You never know when you’ll want to thank someone for their help in an emergency (or bribe them to help you). 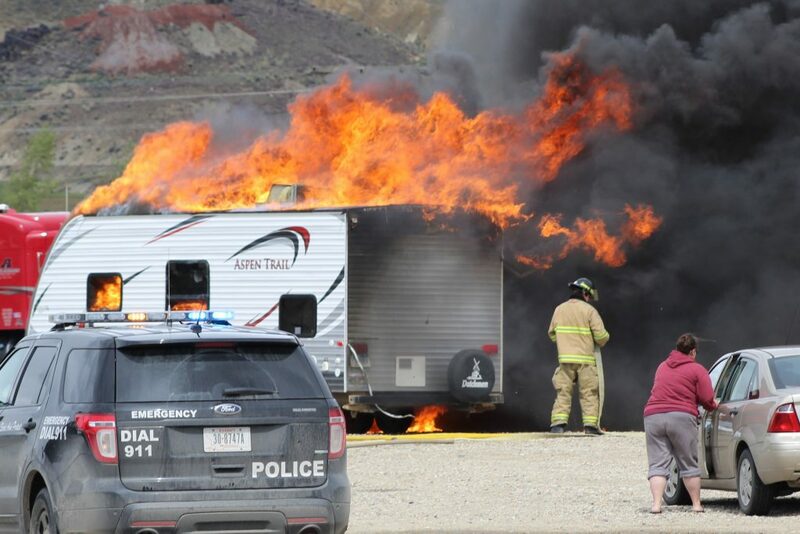 Extra fuses: It may not be a life-threatening emergency, but blowing a fuse in your RV can definitely make your trip less enjoyable than you planned. Pack extra fuses and avoid the issue altogether, but be sure to check what type of fuse your vehicle uses. Toolkit: It’s good to have some basic tools with you for any minor repairs you have to make on your trip. With this 79-piece, multi-purpose toolset, you can fix everything from loose screws to leaky faucets. Multi-tool pocket knife: For small but crucial repairs, you might not want to lug around your toolkit. Keep this multitool pocket knife handle to fix any small problems your RV might be having. Duct tape: Never underestimate the value of duct tape, no matter where you are. Shattered window? Prevent shards of glass from falling back into the RV by taping it up. Broken taillight? Use this transparent duct tape to fix it and keep you and your family safe on the road. Battery terminal cleaner: Prevent your RV battery from malfunctioning with a battery terminal cleaner. Use it at least once a month to remove all corrosion from the terminal. Headlamp: You never know when you might need to make some nighttime repairs on the road. A headlamp frees up both hands and allows you to see what you’re working on. Disposable gloves: When making repairs in the engine compartment and other grimy areas, it can be very helpful to have a pair of nitrile gloves on hand. You should always keep a pair in your first-aid kit as well. Rain poncho: A rain poncho can also be helpful for those drizzly roadside repairs. The last thing you want is to be soaking wet while trying to fix a tire. Tire repair kit: When you’re out in the boondocks, you can’t always call AAA. This tire repair kit comes with everything you need to fix a punctured tire. As a last resort, always carry a spare tire for your car and RV as well. Ice scraper: Be prepared for a windshield full of ice in the morning whenever you camp in a snowy spot. This ice scraper/snow brush combo lets you scrape off that frozen layer and drive safely. Tire chains: When driving in icy areas, be sure to fit your motorhome or trailer and tow car with chains. You’ll be grateful for the extra traction when you no longer have to slide around dangerously on the road. 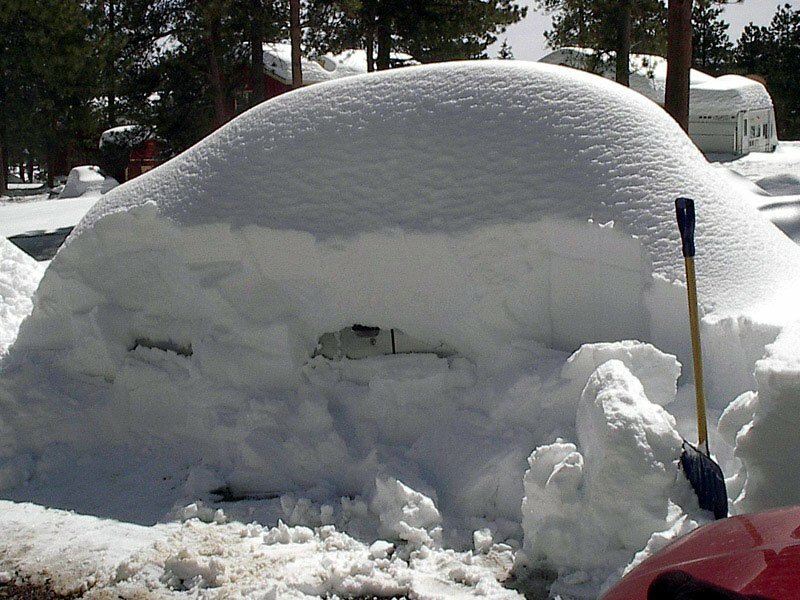 Snow shovel: Always remember to bring a snow shovel when traveling in chilly weather. No one wants to be snowed into their campsite with no way to dig themselves out. Hand warmers: In the event that your heater should fail when you’re stuck somewhere cold, hand warmers can provide heat inside clothing or sleeping bags. This pack of 40 air-activated heating packs will warm the whole family. Rainproof blanket: You should always keep a rainproof emergency blanket tucked away in case you find yourself stranded in a freezing environment. You might break down on the side of the road with a broken heater, so make sure you have a way to keep you and your family warm and dry. Waterproof matches: If your RV breaks down and you are stranded without electricity or propane, a fire can keep you warm and heat up your food. Keep a pack of these waterproof matches in your RV at all times. Accidents happen, and you should always be ready for the unexpected. Having the right gear can be helpful and even save your life in the event of an emergency. Stay safe and add these supplies to your packing list. I have a few slightly different emergency gear items that I carry at all times in my vehicle. Instead of mere jumper cables, I carry a power pack that has jumper cables and sockets for charging other items. I always carry two headlamps and a few other types of LED lamps to flood a campsite. I have a gravity water filter. I have a Miti-Mo JetBoil backpacking stove with fuel canisters and matches that can be used to boil water to pour into liter bottles and throw in a sleeping bag. I carry either/both my 15° or 0° 800-down sleeping bags. If leaving my vehicle is ever necessary, I have my backpack, sleeping pad, tent. I also carry a hiking GPS as well as RV GPS and, of course, cell phone and extra battery power pack. I also have bear spray for protection, but warn that personal pepper spray is not allowed in Canada. Bear spray and pepper spray seem a little redundant – I would just have two cans of bear spray. Thank you Zack, I’m glad you enjoyed this article! I listed bear spray and pepper spray as two different items because while bear spray will sometimes work on humans, it’s not designed for that purpose. Pepper spray is more effective for defense against a person because it contains a higher concentration of oleoresin capsicum. Some pepper sprays even include permanent ultraviolet dye, which can help the police identify your attacker later. Pepper spray won’t work on bears, so if you’re camping in an area with both bears and human threats, it’s probably a good idea to carry both pepper spray and bear spray. I heard if you attempt to use bear spray on s human you can be charged with a felony in some locations. I guess it’s like “too much gun”????. I also read to purchase bear spray in Canada as its more potent. There was just an article pn the web about a 10 year old boy attacked by a grizzly in Yellowstoe, I believe it was,and ot bit him up pretty good. What save d him was family carried bear spray. When the bear spray was used on the bear, it left the scene shaking its head. Article said boy (unknowingly?) got between mama bear and cub, and bear burst suddenly out of the bushes and got the boy. I read somewhere else that bear spray is better than a gun in stopping a bear attack. A bear with a bullet or two in him can still attack before the injury can kill him in some cases; or the injury is not deadly if the panicked human’s aim is poor. Hete in southeast AZ our mountain ranges are full of black bears. Thank you! I’m glad this article was helpful. I might take a quart of my own oil to top off, but changing my oil in the wilderness or a campground will never be an emergency. Just because a sensor tripped a code after a pre-set number of miles, does not an emergency make. Change your oil when you get to civilization. Yes it needs to be done, but your oil will still work in your engine until you get to services or a self service location designed for such a thing. If your oil is sludge, you have other issues that an oil change won’t fix. Wasp spray is illegal to use against people, in the US, it’s a federal crime. And it doesn’t work as well as pepper spray on people. Add a high visibility reflective safety vest (better yet two of them) to the list. Also a spare headlight bulb and tail light bulb (if you have regular filament type bulbs. (and know how to change them). BTW, most of these RV Life articles I have looked at are hokey or pretty useless, lacking substance, HOWEVER this is, I think, the first one I have read that provides real, useful information. Thank You . I’m glad you enjoyed this article, Charles. Thanks for letting me know! I have carried an OC spray called FOX for years. LOVE it, it will knock the fight out of almost anybody. Just like any spray if the individual is on serious mental health meds very good chance it will NOT work on them. With FOX you do not need to hit the eyes directly. Facial area upper chest is good. With some of the sparays you need to get the eyes to be good. WIth Fox recovery time is longer than with some other brands. Wow! Thank you for all of these helpful tips! I will definitely keep them in mid on my next RV trip! Thank you, Gwyneth! I’m glad you enjoyed this article.